It is a bit of a tradition to take a look back at one’s year and see what worked (and what didn’t!) Things change. One of my favorite sayings, and one that I try hard to remember, is that without change, there can be no growth. Kids grow up so fast. They are always changing! I am sitting here remembering how much my son loved trains and how he taught himself to read. Oh, my. Time goes so quickly. In looking back, I took a peak to see just which posts were most popular in 2014. These are the posts people shared the most and liked the best. Some of them were my favorites and I am glad to see that others liked them too. Several came from our Homeschool Unit Study series and can totally be used for boys who are in school too. This blog is changing as well. We are growing (thanks!) and taking a deep look at what we share so we can be sure to provide what you are interested in. If you have ideas, I would love to hear them. Click here to contact me or leave a comment below. I do respond to comments and e-mails. Click through on the links to read our hottest posts. #10. Boys Learning Sensory Bins kind of took me by surprise as I posted it not too long ago. I wasn’t expecting it to make my top 10 but I am glad it did. I am fond of these bins as great ways for some hands-on learning for boys. I included bins for older boys as well. If you have not tried sensory bins, please take a moment to check them out. If you like bins already there are 10 great bins boys are sure to love. #8. The LEGO Movie Games was super popular, likely because the movie was such a hit. This post includes links to The LEGO Movie Games and they are all free play. Also check out The LEGO Movie Book list for a free activity guide link. We like free! #7. I started a series of coding posts and all of them did really well, but this one was on top: Homeschool Unit Study: Coding Games to Play I enjoy finding neat games that you can have fun playing and learn from as well–a win, win in my book. Get boys playing a few coding games and it gets them interested in learning more coding. Here is a link to the whole series. #6 Really Rockin’ Homeschool Unit Study on Robots is one of my earlier posts and we found the info in here to be super fun. Many of the posts I do come from what my son enjoys and I really love to find neat projects for him or special things that I think he will enjoy. We Love Robots! Super glad to see you enjoyed it too. #5. LEGO Christmas Projects has some really cool builds in it. To be honest they are fun to make at any time of the year. #4. With books, games, activities, music, science, crafts, guides and even snacks we knew the Star Wars Homeschool Unit Study would make the list. Super Star Wars fun! #3. LEGO Learning Math Games features six fun games that get boys learning while playing with one of their favorite toys. #2. Crystal from Crystal and Comp guest posted on my site and wrote Free Printable Sight Word Game. This is a great game to play with young boys who are learning their sight words. It even uses LEGO Minifigs as game pieces–you know they will love that. She did an awesome job on it and I am proud to have it on the blog. The top boys’ activity post of 2014 was . . . 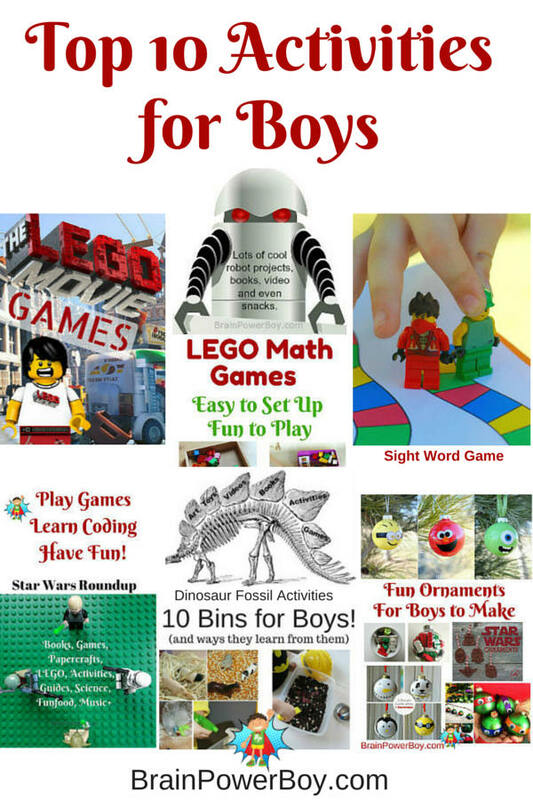 I am so happy to be able to share resources and activities for boys that you can use. It is a privilege to have you visit and I hope you will stop by often. I will be spending 2015 finding great things to share with you so we can all work toward Raising Boys Who Love to Learn! I hope you all had a wonderful year and found a lot of fun things to do with your boys. I am looking forward to this coming year. Great to hear Chantale. Thanks for stopping by. Visiting from Crafty Moms Share… Love these ideas! I have two girls, so am always looking for great boy activities to share with my followers since despite my best efforts my girls are all tutus, tiaras and shoes all the time! Kids will be kids 🙂 Tutus and tiaras or monster trucks and Star Wars and everything in between. Glad you liked the activities–thanks much for stopping by. My son is going to love some of these activities! Thanks for putting them all in one spot!